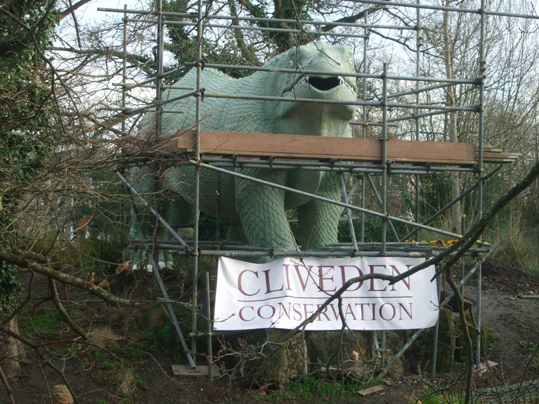 This morning I went for a walk around my local park - Crystal Palace in south east London - and saw that Iggy, one of the famous Victorian dinosaurs, is getting a bit of attention. Apparently the harsh weather has not been kind to him and he needed some repairs and renovations. I couldn't help but feel he has a slightly surprised look on his face. Perhaps he doesn't enjoy being in something that looks like a cage. Can't blame him, but hopefully he will feel better when he is fully restored. There were lots of people in the park enjoying a sunny Bank Holiday Monday in unseasonably warm weather for winter. Some were even picnicking. It is lovely day to get out for a walk though.